Turn your PC into a fortress. Firewalls stop hackers from accessing your computer via Wi-Fi and the internet. A firewall is an essential piece of security software that monitors all incoming and outgoing traffic going through your network, checking for hackers, malware, unauthorized outgoing information, or anything that might put you or your PC at risk. Firewalls are often the first line of defense when protecting your data. Hackers can use Trojan viruses and keylogging software to access your computer and steal your personal data such as your history, passwords, and banking details by recording your sessions and keeping track of your keystrokes. They can also harness the power of your computer to run illicit activities without your knowledge (yes, your PC can be a part of the problem – strange, but true). Cyber criminals can use any internet connection or Wi-Fi network as an entry point into your computer. Firewalls block all unauthorized connections to your computer (including those of hackers who are trying to steal your data) and even let you select which programs can access the internet so that you’re never connected unknowingly. 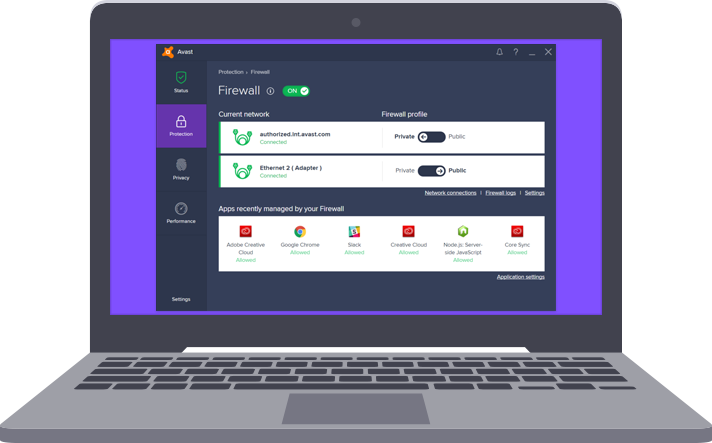 Avast Premier and internet Security both come with Firewall, giving you complete control over online traffic to and from your PC. Do you have Avast Premier or Avast Internet Security? Perfect - your firewall is on by default. To tweak its settings, just open your Avast and click on ‘Protection’. You will find the Firewall icon right there, and when you open it you’ll be given a series of options to customize your firewall.